I lately realized that some people really invest time to cook up stories and lie. They are so compelled to lie that they lie to even those who have nothing to do with their stories. Such people do not have a Pinocchio nose, might not display typical traits of a liar, but they lie with real conviction! This post of about generalisations. I hear a lot of generalisations - and sometime I am myself into it. What I believe is that people with small eyes are deceptive, those with piercing eyes are dangerous, those with huge popping eyes are greedy - more of often then never I have seen that these generalisations conflict somewhere. You can best know a person when that person is completely transparent - about the factors you are studying one for. A friend asked me once that why do I think everyone tells the real story. It got me thinking. How many of us are actually transparent with others? Everyone has an image to maintain, and they fear that image to get ruined, to be judged. I also have an image to maintain, some actions/confessions are reserved to those who I believe will not judge me. This could be a reason for why generalisation exist - people do not show their real self to the world outside, and the world picks up clues from whatever they see or hear and generalise. 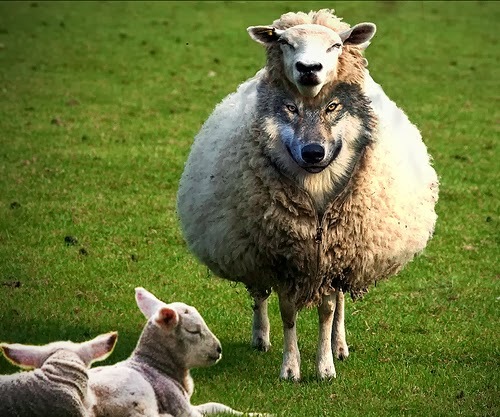 It could be a case that you are talking to a wolf dressed in sheep's attire. So if someone has a long nose (considered to be a feature of people who have good administration skills), do not assume that person lies a lot. A person with small nose can be into a lot of big or tiny white lies - which are still lies. PS: People who think that I believe their lies and cooked up stories, need to know that I mock them. I might not confront you, but I am good at reading a liar.